A few years ago we snagged some RV passes for the multi-day Delfest music festival in Western Maryland and ended having a blast hanging out in the sun listening to bands and retiring to our cozy home at the end of each day. 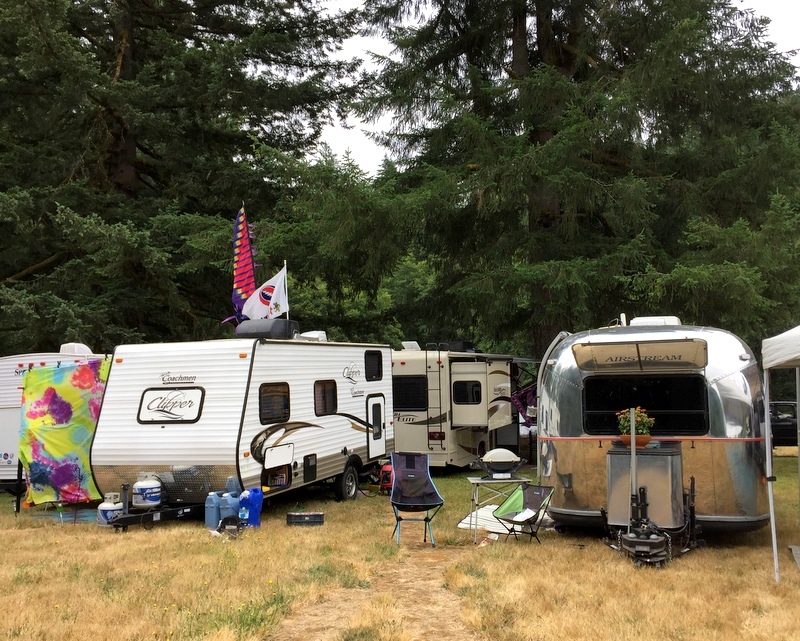 Ever since, we’ve had our eye out for more music festivals with on-site RV camping. A few have come across our radar, but either the timing is wrong, the location hard to reach (yes, we have wheels on our house, but they only go so fast), or the tickets sold out. 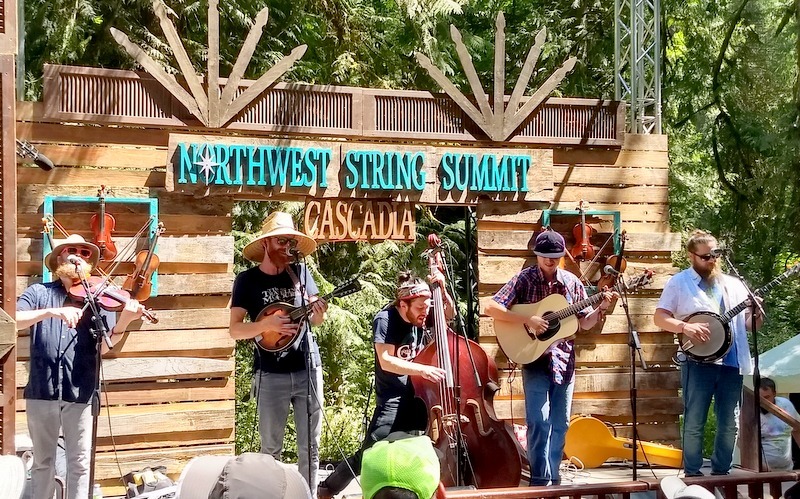 So when Tim came across the Northwest String Summit, which just happened to be in the general area where we already planned to spend the summer, we jumped on the opportunity. By the time we bought tickets, all the RV passes were gone so we quickly booked the last available spot at nearby L.L. Stub Stuart State Park. In the meantime, Tim emailed the event to ask about getting on a list in case any RV pass cancelations popped up. Imagine our surprise when a few weeks later he got a response stating that they had a pass available! I later learned that they added more RV passes due to high demand so that might have how we got lucky. In any case, the RV camping is pretty limited so if we go next year we will be sure to buy our tickets early. The four-day festival kicked off on Thursday with music starting at 2 pm. Not knowing what to expect, we arrived around 10 am in hopes of getting a good parking spot. Turns out that the RV parking area is pretty similar and it wouldn’t have mattered all that much what time we arrived. 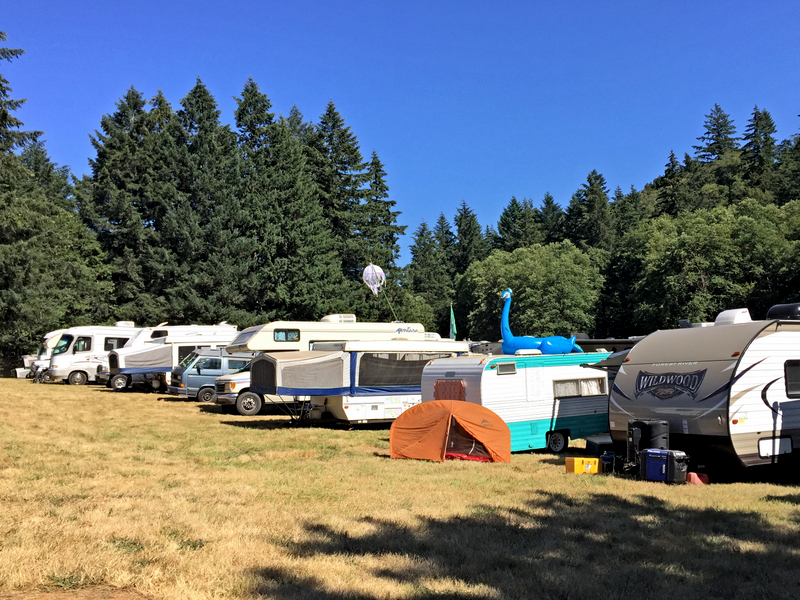 While not at ALL level, the grassy hill was a nice place to call home for a few days and we appreciated the (relatively) ample amount of space. It was also surprisingly quiet and we able to enjoy several afternoon naps and peaceful lazy mornings at home. Enough about all that though…let’s talk music! 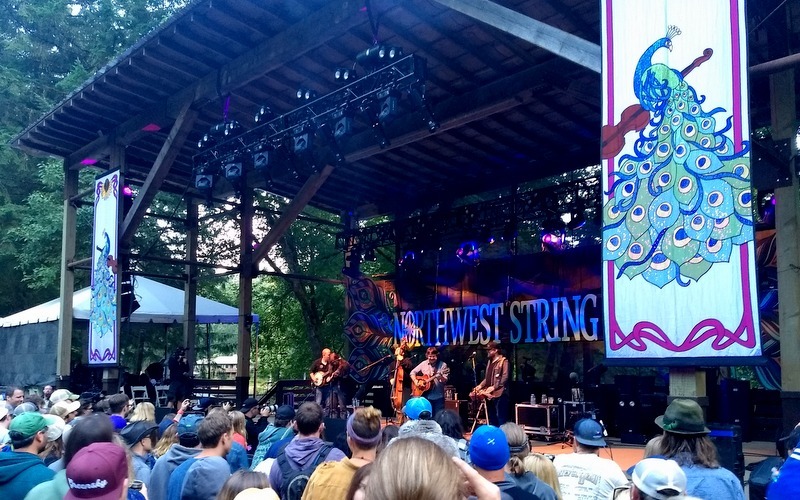 At its heart, the Northwest String Summit is a bluegrass festival. But like any good multi-day festival, all kinds of musical genres, from alternative folk to electronica, were present. 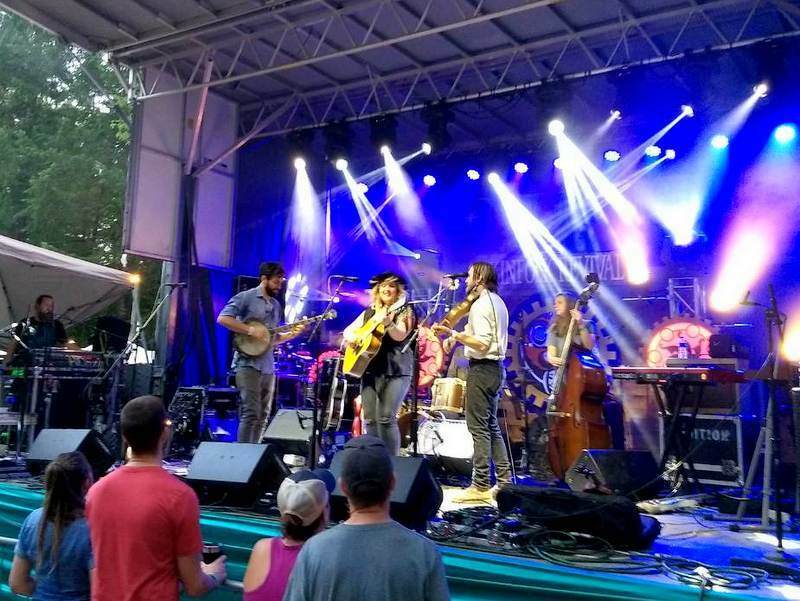 We got to see some of our favorites, like Greensky Bluegrass, while discovering a few new bands, like the Bridge City Sinners who Tim described as the “most Portland band ever”. Look them up and you’ll see what he means. Roughly 50 bands played from Thursday around 2 pm to late into the night on Sunday. 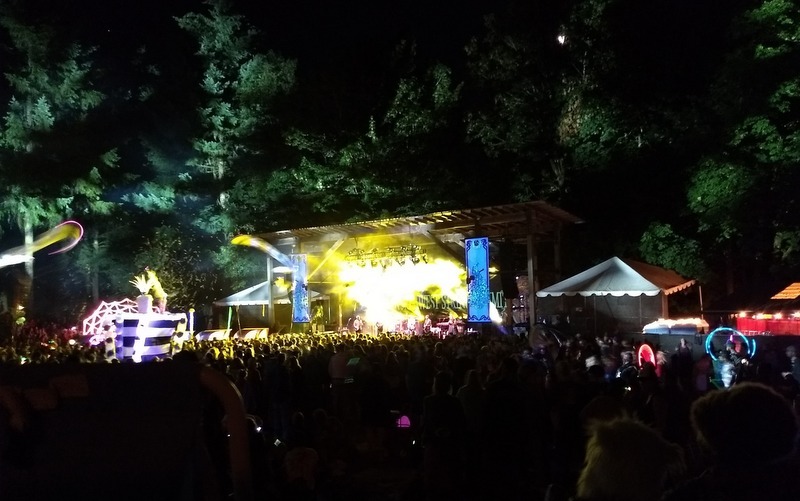 Four different stages kept the crowds at a minimum with the exception of the main stage on Friday and Saturday night when it seemed like nearly all 5,000 of the attendees had congregated in one spot. 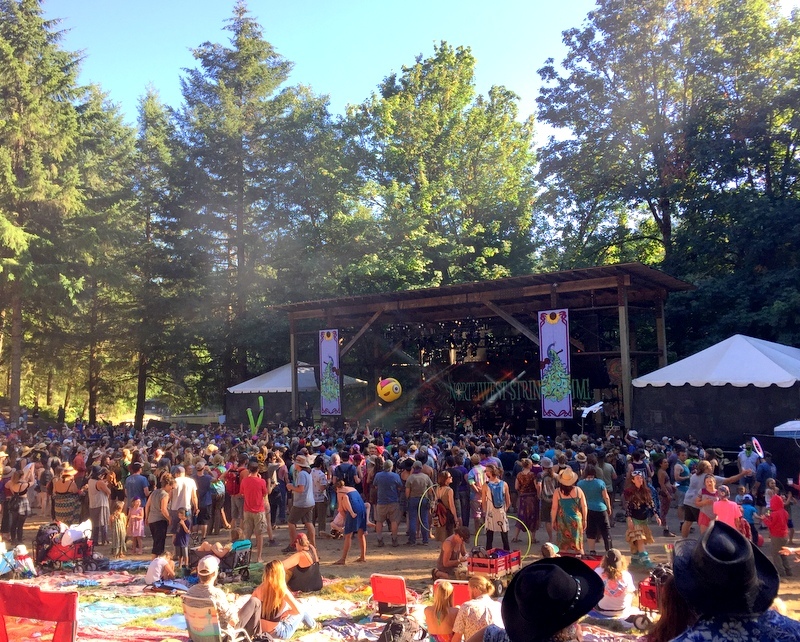 We spent a little time down near the stage early in the weekend, but as it got too crowded we mostly preferred to hang out on the grassy hillside. 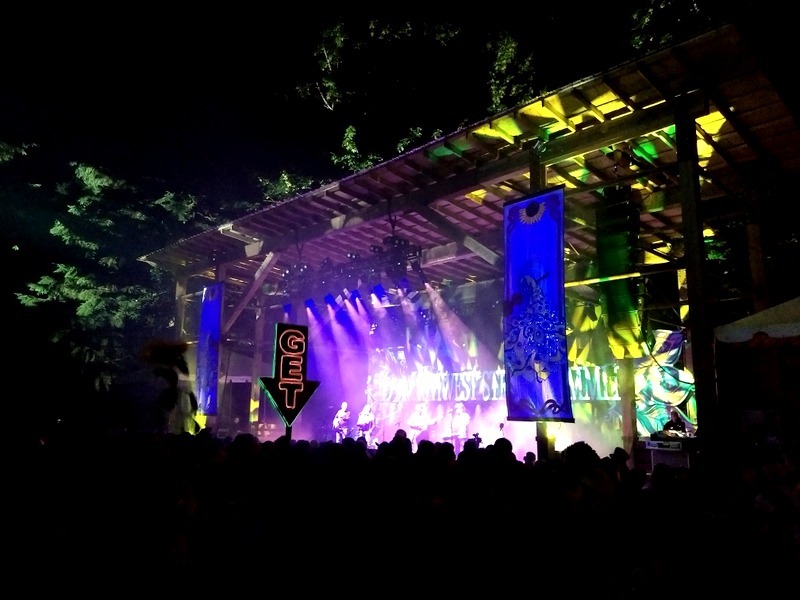 Aside from all the great music, the fabulous setting is what makes this festival so special. 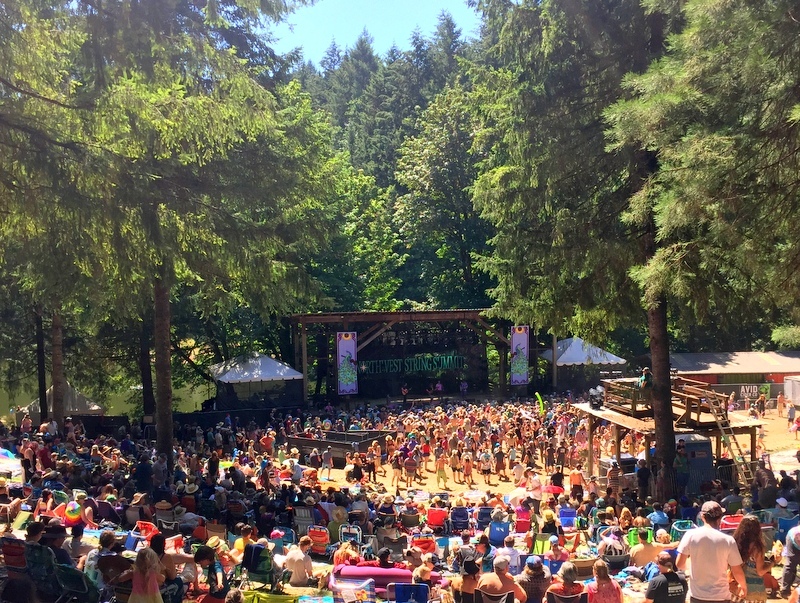 The main stage is set at the base of a natural amphitheater surrounded by tall trees. With a large flat area for the dancers, and a sloped hillside perfect for blankets and chairs, it really is an ideal spot. Can you even imagine a more perfect setting for a music festival? 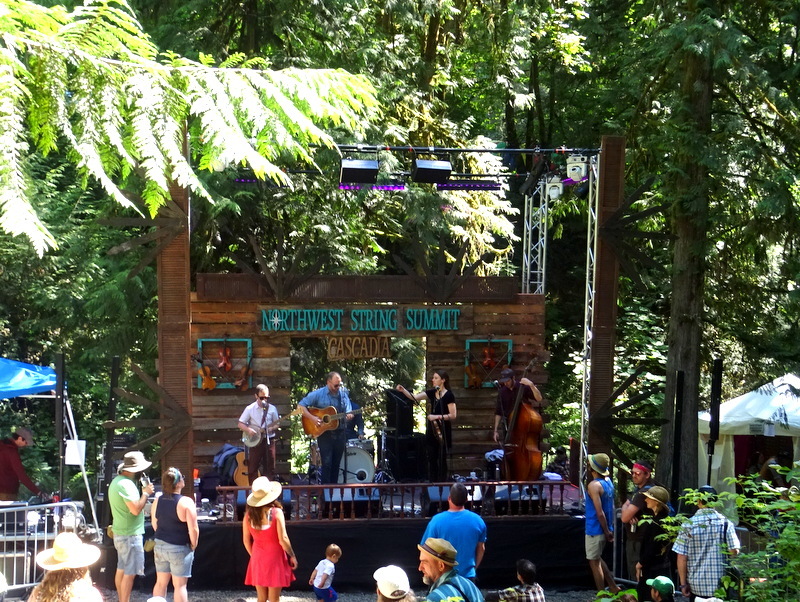 On both Thursday and Friday, we wandered over to the main stage in the mid-afternoon before the music started and simply hung out in our chairs enjoying the setting. One day we grabbed some lunch from the KillaDilla stand and ate under the shade of a big tree while watching the people milling around us. 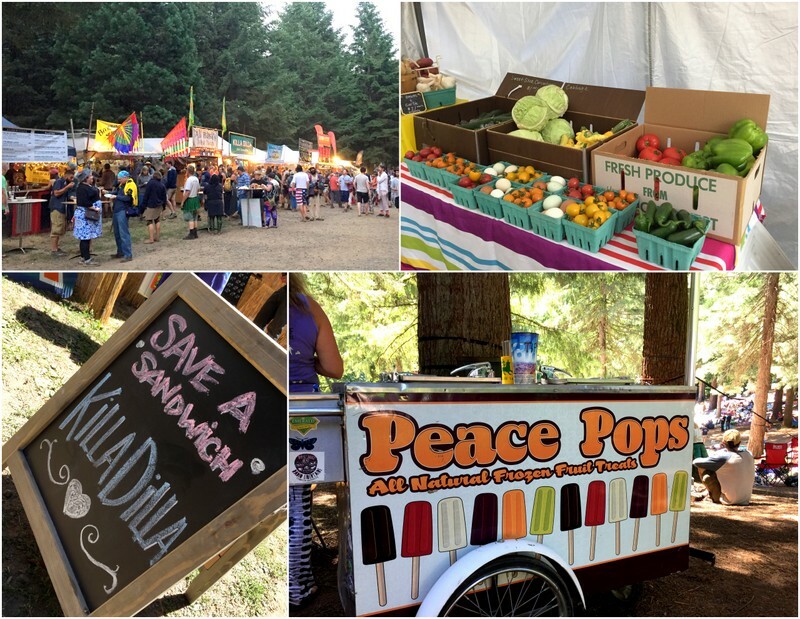 As expected for a festival held right outside of Portland, the food options were top notch. Of course, we brought along our whole house with a fully stocked kitchen, but we also had to try a few things from the various carts and stands. It was all good, but I think the very best thing I ate was a chocolate fudge pop made with coconut milk from the Peace Pop cart. At the end of the weekend, we both agreed that some of our favorite musical performances happened on the smaller stages. The more intimate setting allowed us to get closer to the action (in my case this meant actually being able to see the people who were playing the music) without feeling like we were squished inside a mass of sweaty, flailing twenty-year-olds. 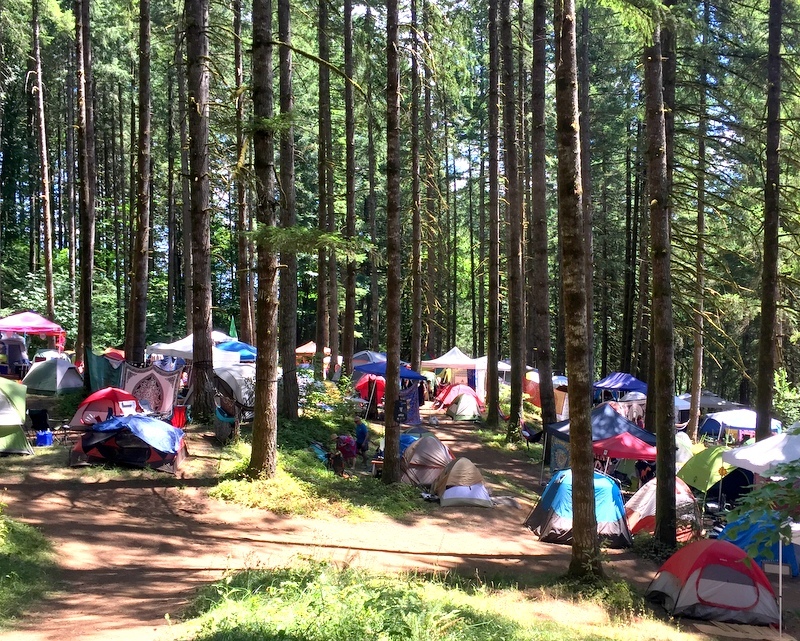 Of the three smaller stages, the Cascadia Village stage was by far the most scenic with a tiny little wooden structure nestled into the trees near the tent camping area. The small setting and somewhat remote location kept the crowds to a minimum and on two different days we started off the morning there with some music in the sunshine. The Kinfolk Revival stage was bigger than Cascadia, but still small enough that we were able to stand close without it feeling too crowded. Tim saw Greensky there late night on Friday while I stayed home and slept (I am not at my best from 1-3 in the morning) and then we ended the weekend there with the Last Revel and Fruition. Finally, the Peacock, or Tweener, stage was a nothing more than a small platform at the top of the hill near the amphitheater wedged between the medical tent and the food court. A couple dozen bands played here throughout the weekend between sets on the main stage. It was a really cool way to see some of the smaller bands even if the location basically right in the middle of the main thoroughfare was a bit odd. 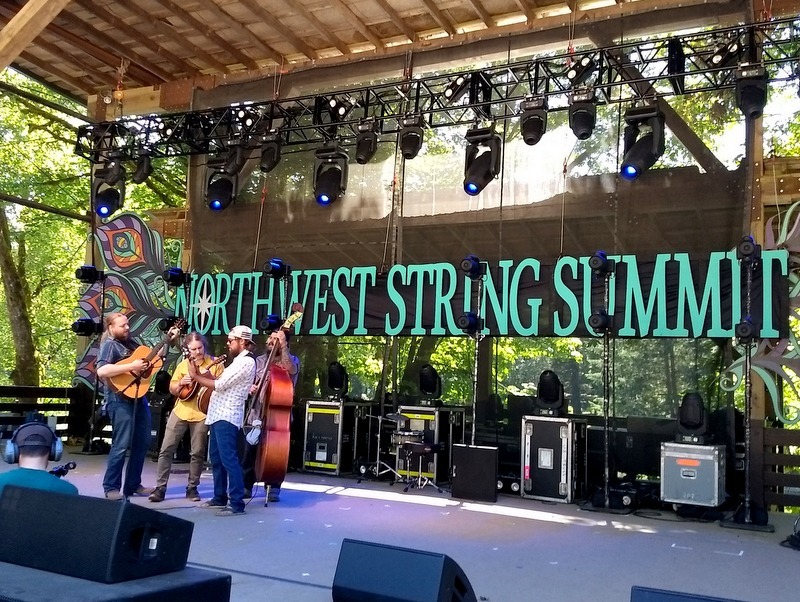 Overall, the Northwest String Summit was a fantastic experience. 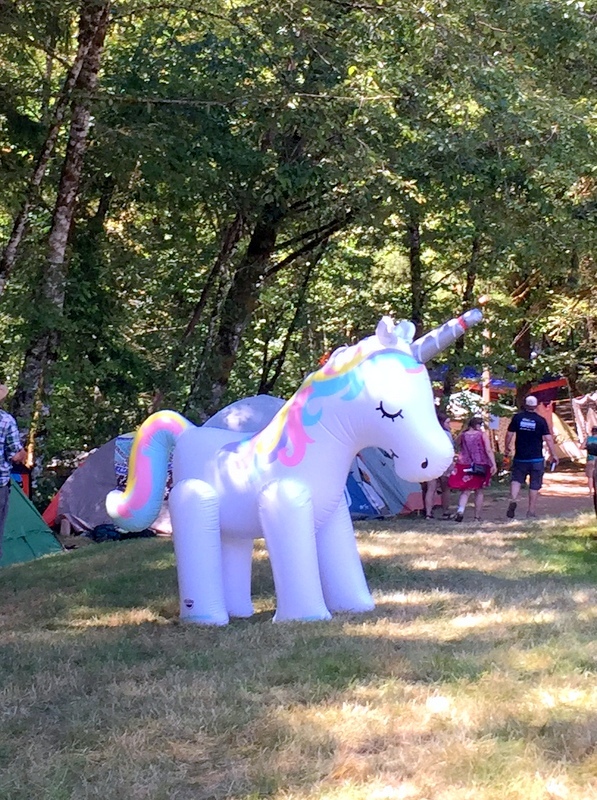 We saw some great music, ate lots of tasty food, had plenty of down time to relax, enjoyed hours of excellent people watching, and best of all, relished a few days of being unconnected without cell service for the first time in months. It’s too early to say for sure, but there’s a really good chance that this will not be our last String Summit experience! Loved the article about the string festival. I would love that, but not the people around me. Not into big groups. Glad you enjoyed your time there. You’re right, there were a lot of people there! Definitely not an event for those who don’t enjoy crowds. Looks like an awesome event! I think Tim is spot on in his description of the Bridge City Sinners! Now that’s quite a bit of Blue Grass and such. My best high school friend plays fiddle for a small local group. It is fun to see him in the small stage, but that is a huge gathering! At least your home is within walking distance :) ENJOY! I am not sure we could ever attend one of these multi-day festivals again without having our home right there. It was so great that we had a spot to rest and relax away from all the people. Definitely on our list! Looks like you guys had a blast. 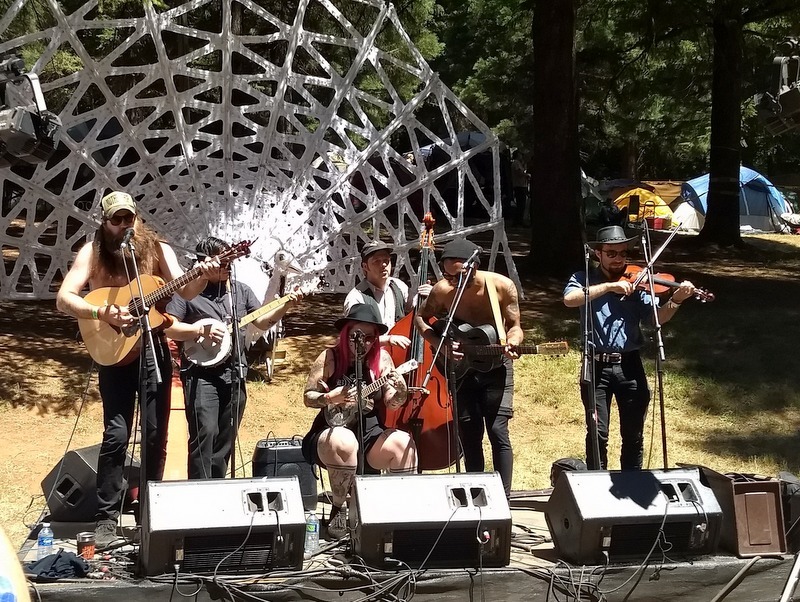 If you ever find yourselves near Sisters, OR the second weekend in September, check out the Sisters Folk Festival (all genres, not just folk music). You would love it. 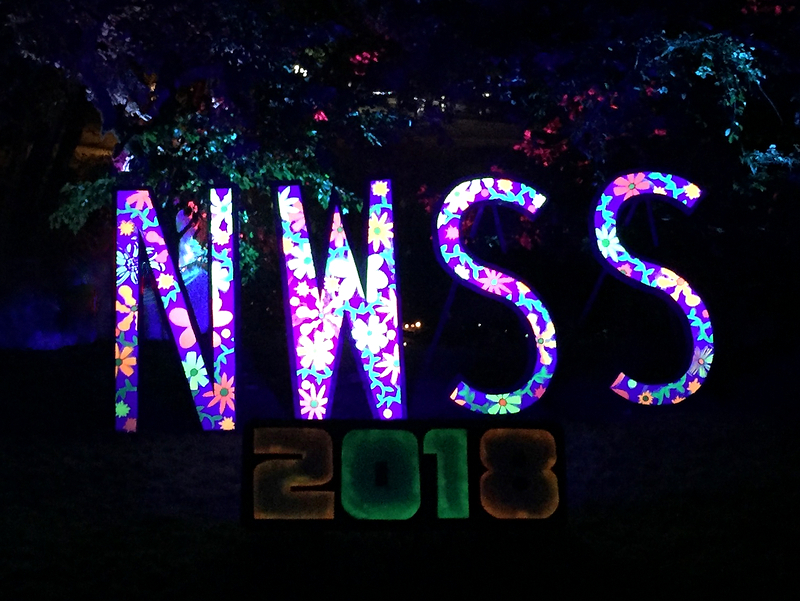 We have a couple of posts on our blog if you’re interested (https://ravenandchickadee.com/2015/10/the-sisters-music-festival/). 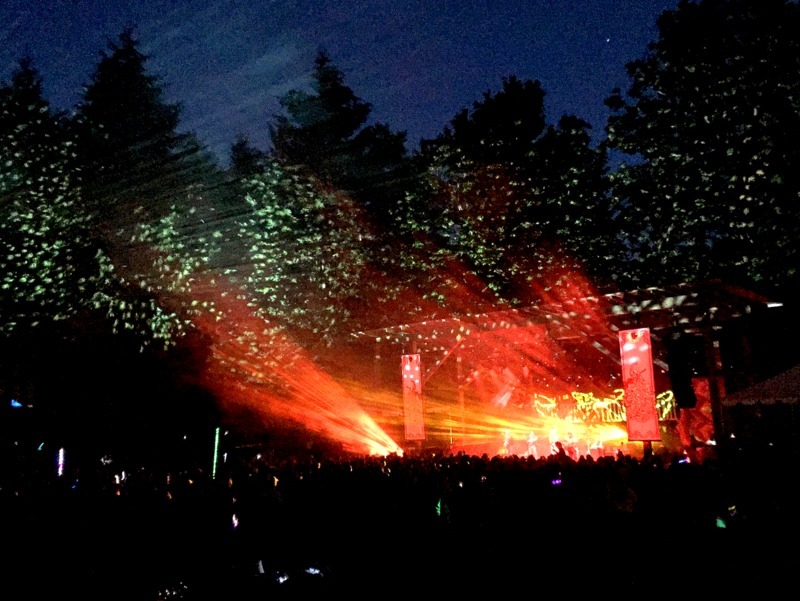 You captured some very cool nighttime photos! Oh yeah, the Sisters Folk Fest has long been on our list. Someday we will make it there! BTW, Tim and his Google phone get all credit for the night time photos. That phone camera is amazing in low light!